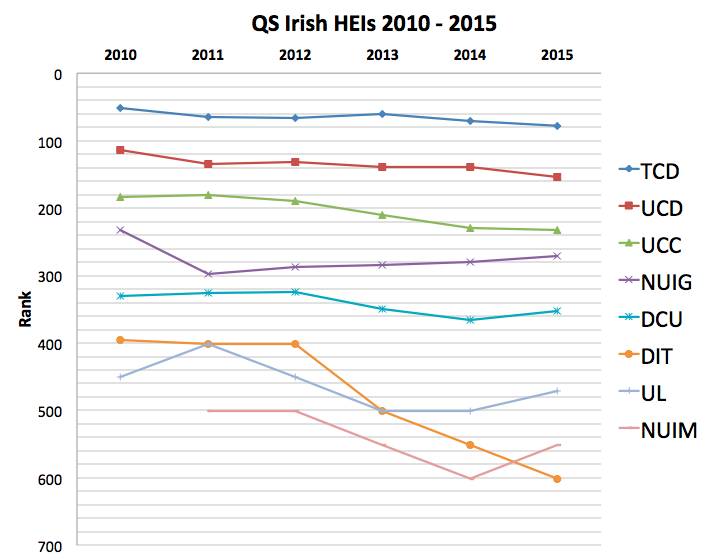 So the QS World University Ranking 2015 is out, and for what it’s worth this is what it looks like for Ireland’s HEIs from 2010 to the present. The QS methodology is heavy on the reputation surveys, clocking in at 50% of the total, over which the institutions have very little influence themselves – and government, the HEA, the IRC, or whoever else has even less. The remaining 50% is down to faculty/student ratio (20%), international staff and student ratio (5% and 5%), and finally citations per faculty at 20%. 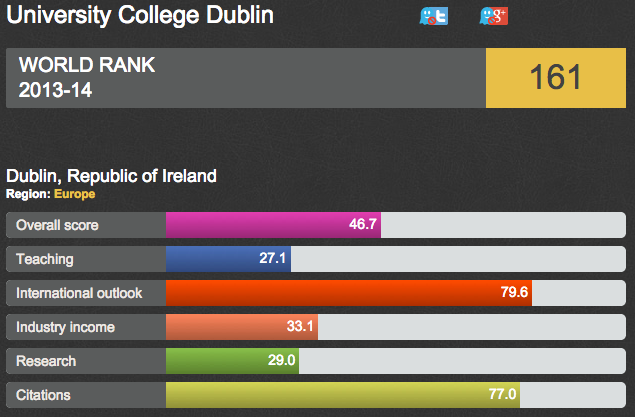 Citations is probably the one thing that institutions might be able to do something about more readily than other areas (i.e., it doesn’t require new hires) but note that the bibliometric indicators and databases that are used to calculate such scores are biased against some areas in which Ireland does well (humanities). It’s not enough simply to change or improve, because this is only sufficient for survival. 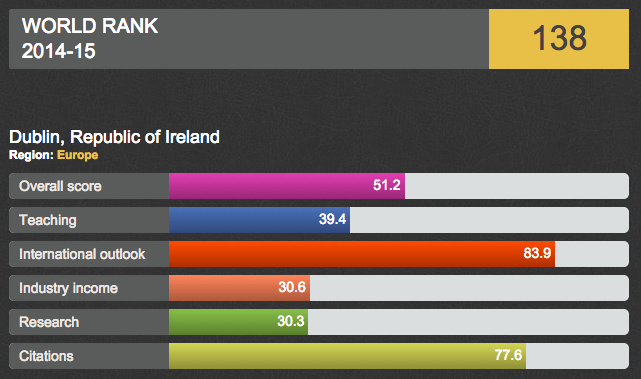 So how do Irish HEIs compete in a world like that? This entry was posted in Higher Education, Rankings and tagged higher education, Ireland, rankings, university rankings on September 14, 2015 by Andrew Gibson. The growing influence of academic rankings. Follow CHEA on Twitter: @ciqgnews. This entry was posted in Higher Education, Rankings and tagged higher education, rankings, university rankings on February 2, 2015 by Andrew Gibson. Rankings in Institutional Strategies and Processes project report launched. The full text of the report is available for download now from Dublin Institute of Technology’s Arrow repository now at this link. This entry was posted in Higher Education, Rankings and tagged governance, higher education, rankings, university rankings on November 14, 2014 by Andrew Gibson. A piece by Ellen Hazelkorn on the the Times Higher Education website: “How much attention should universities & governments pay to rankings? Here are Ellen Hazelkorn’s dos and don’ts”. This entry was posted in Rankings and tagged education, higher education, rankings, university rankings on October 14, 2014 by Andrew Gibson. There are about 18,000 university-level institutions, according to the International Association of Universities. 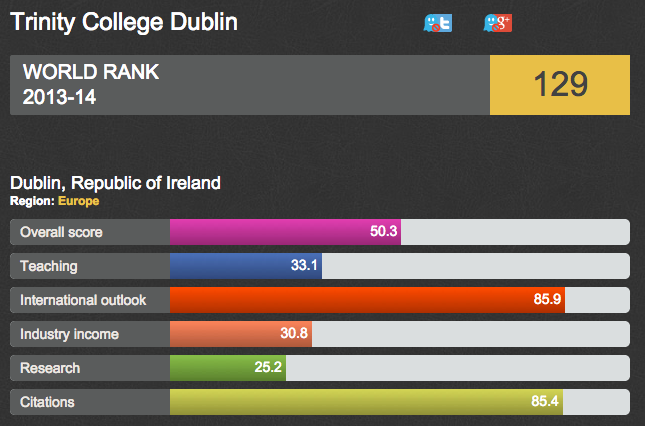 For Ireland, being in the top 500-600 represents the top 3 per cent of all universities worldwide. If we believed in rankings this is something of which we should be immensely proud. It has been estimated that the annual budget of a top-100 university is about €1.7 billion. This is would consume almost all the annual budget for Irish higher education, which is about €2 billion. To pursue a national strategy based on rankings would require diverting the entire budget to a single university on an ongoing basis – because one injection of funding would not be sufficient. But money isn’t the only issue at stake. It’s not evident that the indicators used by rankings measure what is meaningful. Thus, to shape our national higher education policy and priorities according to indicators chosen by (commercial) ranking organisations would constitute the abandonment of national sovereignty. Why should we do this? This entry was posted in Rankings and tagged education, higher education, rankings, university rankings on October 7, 2014 by Andrew Gibson. Notice anything? The overall score is withheld. Sure, there are clear differences in the individual indicators, but what do these mean? Did UCD’s researchers really publish 15.3(%? Notches? Magic beans?) less this year (Citations)? The difference in Research is 0.9, so the “volume, income, and reputation” seems to be more or less intact. Teaching has actually improved by 4.6. 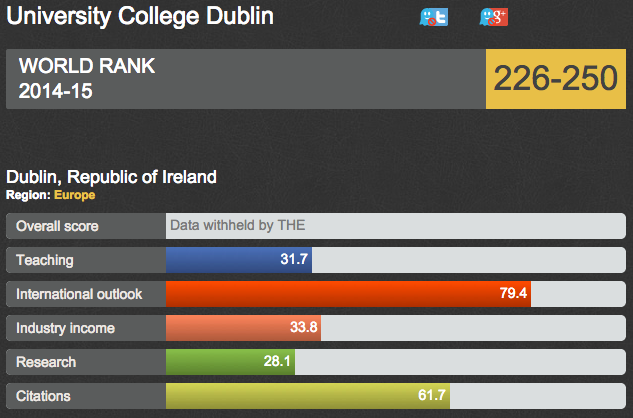 At best, however, the overall ‘improvement’ in score by TCD could indicate (charitable interpretation of the ranking) that other universities are also improving, but that they have improved quicker. This echoes the truth about life among predators in the wild that you don’t necessarily need to be the fastest to survive a predator – you just need your neighbour to be slower than you. An Irish Times article goes on about the above, saying that “main impact of the cuts has been on the student-staff ratio, which is one of the major factors used by all the ranking agencies.” Which is true. But the OECD in its recent Education at a Glance report notes that staff-student ratio is not an indicator of teaching quality, nor teaching outputs, nor results. It’s an indicator which has been jumped on because it is an intuition pump, in that it “elicits intuitive but incorrect answers.” There is as much evidence saying that large classes can lead to better learning outcomes as suggests the opposite. One may then be inclined to agree with Prof. Andrew Deeks of UCD when he says “Our own analyses show that in terms of objective measures of teaching and research performance, we are performing well and making good progress.” The call to reverse cuts, in the hope that this will magically lead to an improved performance in rankings is a political argument. And that’s fine. But beware of rankings bearing ill-tidings. Rankings measure what they measure, rather than measuring the objective reality of higher education – and what they claim to measure may be questionable in and of itself. This entry was posted in Rankings and tagged higher education, university rankings on October 2, 2014 by Andrew Gibson.